Painted for the Wildlife Trusts’ National Marine Week. It’s on a wall next to Portsmouth Museum, on the main road to the Isle of Wight ferry, and so reaches an audience of thousands. It also forms part of the Hampshire and Isle of Wight Wildlife Trust’s campaign to protect the Solent #livingseas. National Marine Week celebrates all the wonderful creatures that live in the seas around the UK, many of them little-known and mysterious. 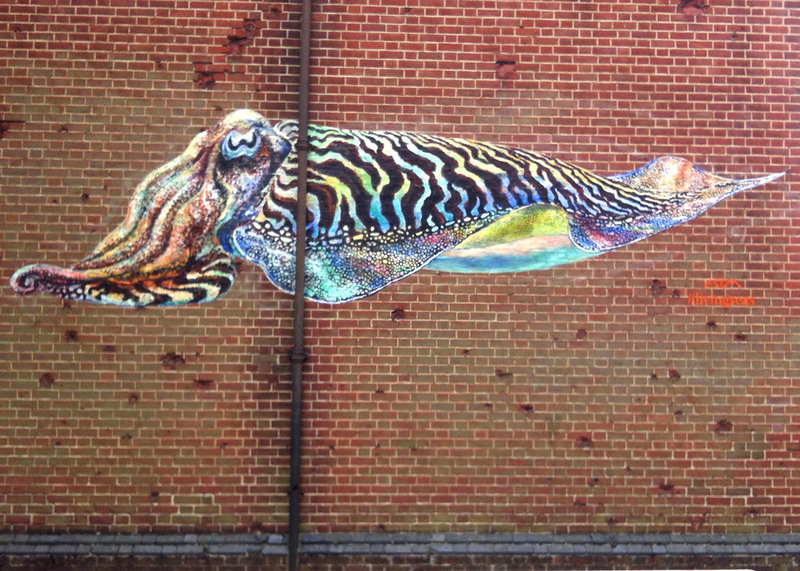 Cuttlefish have three hearts and an ability to change their colour and skin texture to merge with their surroundings. They also perform spectacular light and colour displays across their bodies. They migrate to lay their eggs in the seagrass meadows of the warmer waters around the UK. They thrive in the Solent, the stretch of sea between mainland England and the Isle of Wight. The seagrass is a very important and now quite rare habitat. It nurtures myriad species, from young fish to sea horses, crabs, shrimps, sea squirts and sponges. I was lucky enough to have a tour at low tide in the company of HIWWT marine expert Tim Ferrero, who revealed some of its mysteries.